Pause the footage and zoom in to play 'pin the tail on the donkey'! 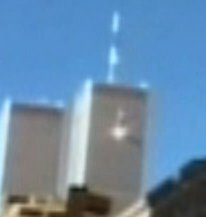 Another amateur piece of footage of the North Tower impact and, yes, you guessed it, no plane in plain sight! play 'pin the tail on the donkey'! You could have had my eye out with that. Witness "I just saw the entire, err.. top part of the world trade centre explode, so err, I turned on the tv and when I heard they said it was a plane it was really strange"
Lets try this from the top shall we? 4. faked impact hole(why only the good lord above will know). 9. eyewitnesses saying they didnt see the plane hit but looked when they saw the explosion. 1. disinfo agents faking and reposting on the net. 2. differant angles between each photograph compared. 3. time to focus camera. 4. prespective of filmers and photographers. 6. time on our hands to wake people up. 7. how any of this looks to outsiders. 8. anything people have to say about NPT evidence that dosnt support the theory. 9. witnesses who did see a plane prior to explosion. 12. ability to prove the evidence to a court/media. should i submit now and end this post here? YES. If you believe in NPT I'm happy for you... but realise your in the minority and also realise that no matter how often you post distorted and intellectually flawed "evidence" you still won't convert us because WE'RE NOT RETARDED, thanks. you still won't convert us because WE'RE NOT RETARDED, thanks. I know, you're just deeply unconscious. You should try meditating. Everything in life is based upon perspective and this is equally true of photographic perspective. Even a fairly slight change of view can dramatically alter what you perceive. 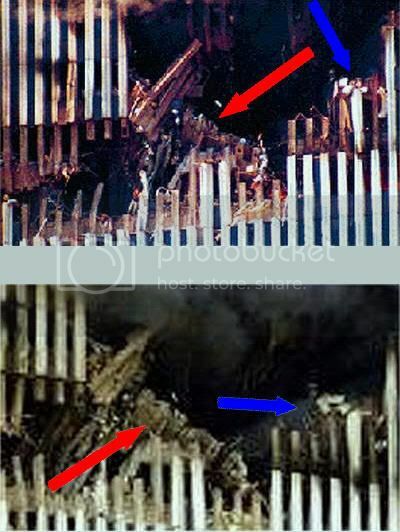 The blue arrow in the bottom image points to the area in the back of the building that the arrow in the top image cannot see (it being around the corner so to speak). This is borne out by the obvious 'softening' of the background, it being further away. The shift in the angle of view allows it to be seen, in contrast, the more head-on view means to say it cannot be seen. Moving up and around means that we can now see the objects that were masked in the softer focus (lower res) picture, from a more horizontal plane. Nothing has been altered, the author simply has little to no idea about the effects of changing perspective. 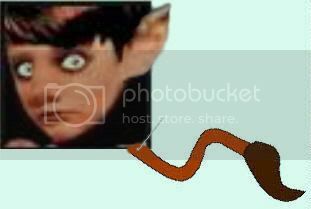 Perhaps you should try thinking Donkey Boy!